Their use in beer-making aside, young hop shots are a delicious early spring vegetable. 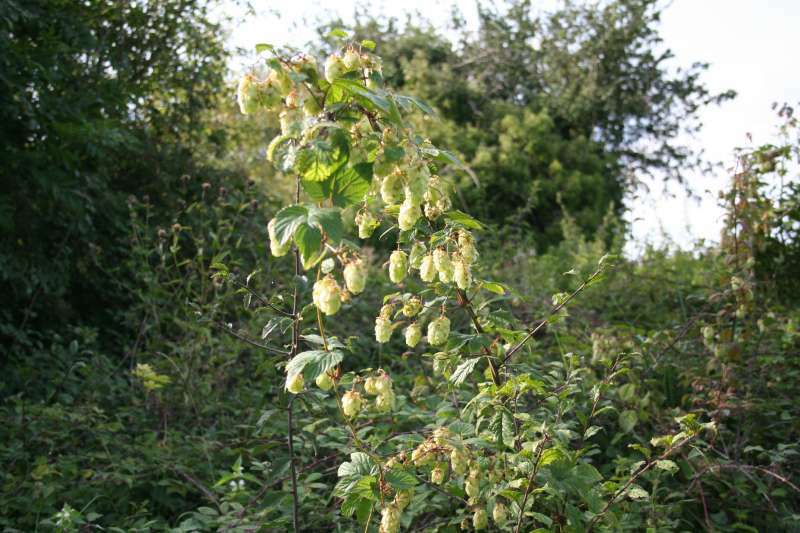 The pictures below were taken 4th May, 2009 in the hedgerows around Burwell, Cambridge where wild hops are very common and are a 'must have' in our spring larder. Humulus lupulus is related to cannabis, but no, I'm not aware of it having any narcotic properties. However, though I've never tried it myself, I have also heard of Cannabis sativa being used as a pot herb! Photograph 1 shows the foliage with the young shoots reaching for the sky. 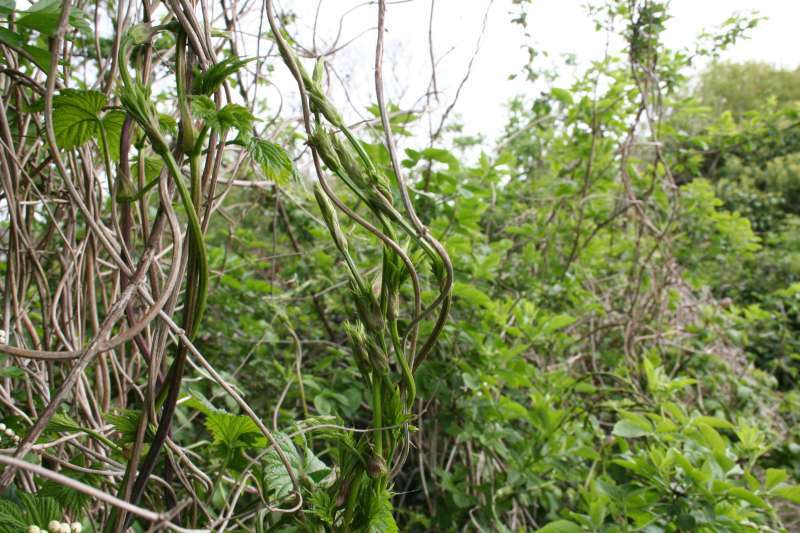 Photograph 2 shows the hops climbing up an elder. 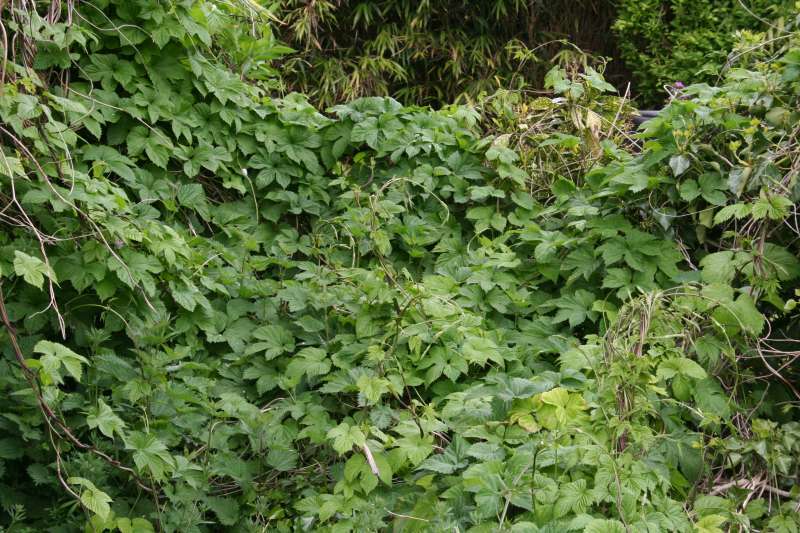 Photograph 3 shows a hedge clothed in hops. The fourth photo shows the shoots clearly: here they are climbing up the woody remains of last year's growth. To harvest the shoots, break then off at a point where they snap easily: usually the top two, or three segments. Below this they are woody and unpalatable. 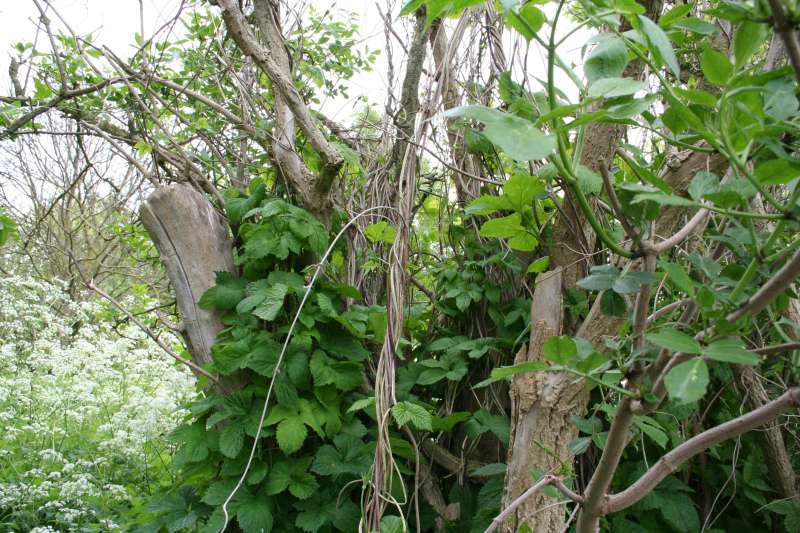 The older leaves could be eaten as well as any other parts of the plant if not too woody. The roots can be eaten. The hop is very good medicinally: see links at bottom of this page. The best shoots grow in a reasonably damp place - though most of East Anglia cannot be considered 'damp' - and are those which have a good support to climb. Pick them early, while you can still reach the growing tips! The shoots can be eaten raw, but they have a sticky feel on the tongue as they are covered in very short bristles. The taste is pleasant raw but the texture not so. Once cooked, taste and texture are excellent! Cook as you would asparagus. In fact, they have been referred to as 'poor man's asparagus'. 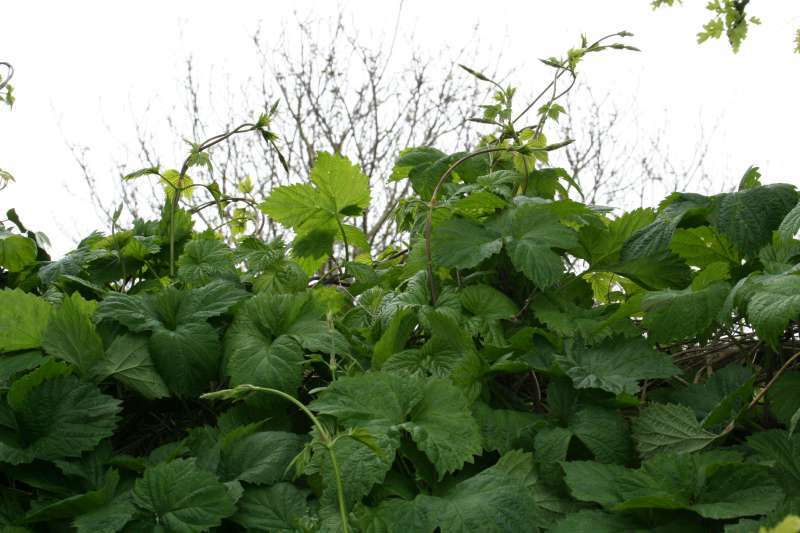 In the hop fields of Kent, the workers used the thinnings as a vegetable - for pinching out the growing tips causes the hop side shoots to develop. The 'hops' harvested for beer etc. are the female flowers. Hops are dioecious - male and female flowers are borne on separate plants. Moreover hops propagate by rhizomes rather better than by seed, so you will find groups, even areas, of male plants and separate groups of female plants. 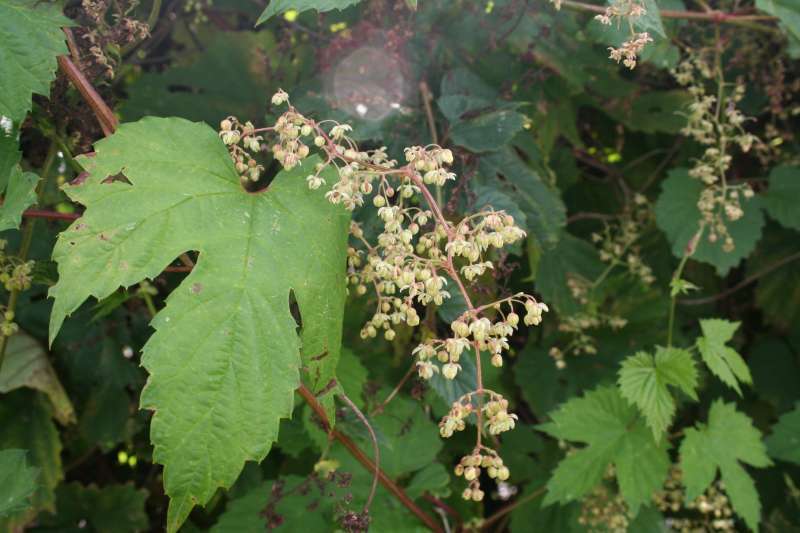 Plants for a Future on Humulus lupulus. Page first published Saturday the 13th of June, 2009.